A program that supports St. Helens students in need by providing food for them on the weekends recently received one of the largest single donations from a longtime donor and supporter. 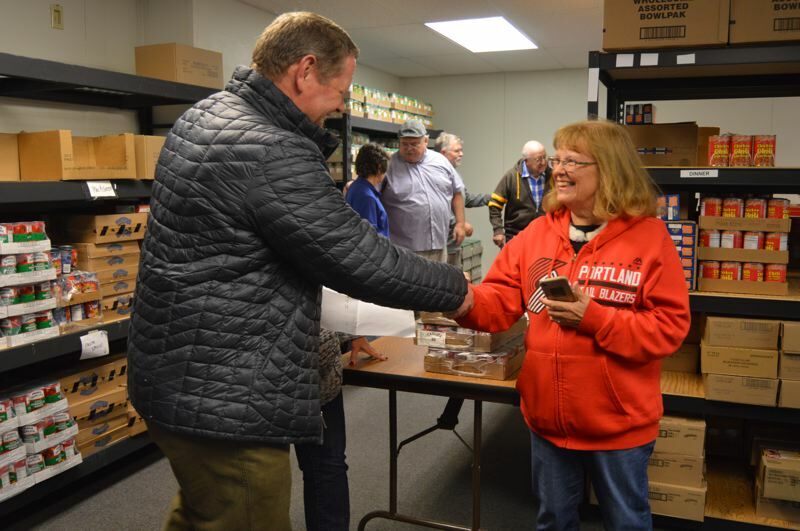 The St. Helens Backpack Program received a donation of 1,620 jars of peanut butter, which was purchased and donated by employees from NuStar Energy, marking one of the largest donations the company has made to the local nonprofit. On Nov. 29, Robert Dowell's half-ton pickup truck was loaded with nearly 2,200 pounds of peanut butter being delivered to the program's storage site at Lewis and Clark Elementary School. Dowell and his wife, Kelly, have been longtime Backpack Program supporters and have made regular contributions since 2013. Through his employer, NuStar Energy, Dowell has run annual donation drives to collect jars of peanut butter and cash. This year, Jeff Hibner, the facility manager for the NuStar office in Northwest Portland, helped Dowell facilitate the fundraiser. Together they were able to get more bang for their buck by collecting monetary donations from employees and corporate donors from August to October. In total, they collected $2,733 and purchased an entire flat of jarred peanut butter, with an additional $481 cash donation. "It's almost overwhelming. You know, we all struggle financially at home in some way, but you have all these people willing to step up and donate. It's incredible," Hibner said. Last week, Dowell and several coworkers from NuStar Energy helped deliver the donated peanut butter. As numerous Lions Club volunteers helped unload the jars, Dowell joked that he was driving like a grandma all the way from Portland to St. Helens with the weight of the items bearing down on his truck bed as he drove to the school. "It was really all the truck could take," Dowell said. During the school year, The Backpack Program in the St. Helens School District provides students who qualify for free or reduced-price lunches with bags of food on Friday afternoons so they have meals on the weekend when school is not in session. The program is supported primarily by volunteers with the St. Helens Lions Club and the First United Methodist Church, and its operations often rely on cash donations and generous community members. The number of students served varies year to year. This year, 208 students are benefiting from the program from elementary school to high school. Volunteers rotate meal options weekly, but always provide three meals for each day, along with snacks. With the most recent donation, the Backpack Program will be able to provide even more meals for students throughout the year. While the donation itself is a big show of support, Judy Parmley, a program organizer, said the true joy and payoff is seeing how students in the community benefit. "When you see a kid walk down the street holding a big bag of food in their arms, it's all worth it," Parmley said. provide to the Backpack Program. Those interested in supporting the St. Helens Back Program or who want to volunteer or make a donation should contact Claudia Peterson or Judy Parmley at 503-397-0061. During the month of December, organizers are hoping to raise enough money to purchase holiday meal vouchers from Market Fresh grocery store in St. Helens for each family that benefits from the Backpack Program. People are encouraged to purchase vouchers at the store or donate cash to the program or St. Helens Lions Club.